Everyone looks forward to spring with its fresh air, colorful flowers, and sense of renewal. But there are many hazards associated with this season. We should always be on guard when it comes to our pets and potential dangers. Many areas of the country have a problem with snails; people often put snail bait in their garden and flower beds. The most common snail bait contains metaldehyde that is very toxic to pets. Dogs will readily ingest it and will start to show symptoms in a few minutes to a few hours. Tremors and twitches can progress to seizures. One company manufactures Sluggo Slug and Snail Bait containing iron phosphate that is much safer for pets. The Easter holiday can bring its own set of problems. Easter lilies in an arrangement of cut flowers or outside in the garden are very dangerous for cats. Ingesting even a small amount can cause kidney failure in cats. Early signs may be lethargy, drinking excessive amounts of water, and then not drinking enough, and a poor appetite. Signs of worsening kidney disease are vomiting, diarrhea, and eventually anemia. Other Easter dangers include the plastic fake grass placed in baskets. Pets ingesting this can obstruct or the plastic grass can actually cut the intestine and cause peritonitis. Cats are especially prone to eating these linear foreign bodies. Symptoms are vomiting, lethargy, and not wanting to eat. Other items in those Easter baskets, such as chocolate, plastic eggs or toys, can also cause illness if ingested. Warm weather that comes with spring also brings parasites, especially fleas, ticks, and mosquitoes. Fleas can carry tapeworms, cause allergies and skin problems, and in some areas of the country carry plague. Ticks can carry several diseases that can be transmitted to pets and people: Lyme disease, Rocky Mountain Spotted Fever, and Ehrlichia. Mosquitoes transmit heartworms to dogs and cats. All dogs and cats should be on a monthly heartworm preventative and monthly flea and tick control. Some areas of the country have a problem with foxtails, a seedpod from a weed. These seedpods have very sharp barbs that can penetrate skin or the foxtail can migrate up nostrils, into ears, eyes, or any orifice. Once inside the body they can still migrate, even into the chest, abdomen, or brain. Signs include sneezing, draining tracts in the skin, shaking the head and ears, or squinting of an eye. Spring brings many people into their yards and gardens. New landscaping materials can also be dangerous. There is a popular new product, cocoa bean mulch, which is a byproduct of chocolate production. It is attractive and has a great odor, unfortunately dogs also think it tastes great! It contains theobromine, and its ingestion causes methylxanthine toxicosis. Symptoms are vomiting, tremors, and increased heart rate, even seizures and death can occur. 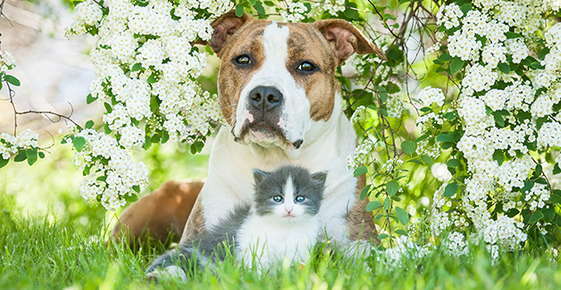 When landscaping your yard, take into consideration if the plants can be toxic to pets. There are numerous plants that are poisonous, with a variety of toxins and symptoms. Many just cause mild symptoms such as drooling or an episode of vomiting, but some plants are very dangerous, for example oleander and sago palms, and can easily cause death if ingested. The ASPCA Animal Poison Control Center web site is a good source of information for all types of poisons and toxins. "I like the fact that the staff at Main Street Veterinary Hospital is friendly, knowledgeable, and helpful. I would recommend them to my friends and family." "I appreciate the convenience and quality care offered at Main Street Veterinary Hospital. They are very thorough and they are always able to work us in any day. Our dog seem comfortable here. I would recommend them." "I have never been to a vet that was so caring ; the entire staff was amazing. I felt like they treated my dog Rascal like he was one of their own and answered all my questions in great detail. I felt blessed to have been referred here." "Joshua came for shots and a heart worm test, which ended up positive. I am thankful for Dr. Pierson and the vet tech that helped Joshua and I to understand his diagnosis." "Polly enjoys her weekly visits for her bath! Everyone seems to like Polly and spoils here rotten! I love it! You all are the BEST! Keep up the GREAT work!"